Smoothies are now a popular and staple part of a healthy daily diet. They are nutritious, filling and are a perfect way to pack a ton of nutrients, vitamins and minerals into our bodies without spending large amounts of time preparing and eating large amounts of whole fruit and vegetables. But what about a smoothie in a bowl? The beauty of a smoothie bowl – which are generally thicker than normal smoothies in a glass – means that it is possible to sit down and include healthy additions that wouldn’t be possible to fit into a glass: shredded coconut, chia seeds, whole pieces of fruit, sliced almonds, hazelnuts, cacao bits – the possibilities are endless. What I particularly love about smoothie bowls are the combinations of fruit and vegetables that I can combine to suit my mood, and the fact that many combinations are gluten, dairy and sugar free and are suitable for vegetarian, vegan and paleo diets. Most recipes often start with a base of bananas and frozen fruit combined with greens, juice and yoghurt, but can be changed as much or as little as you like depending on your taste presences. They are a fantastic way to start the day and are suitable for a healthy breakfast all year round. 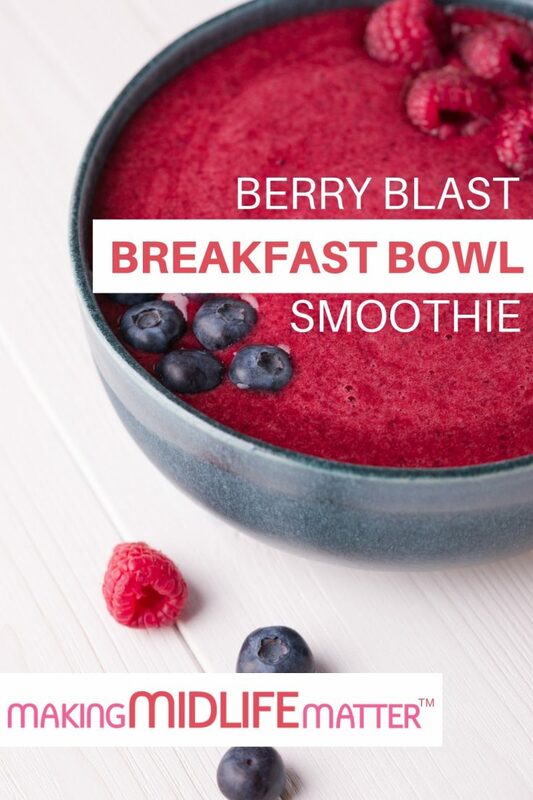 By making a Smoothie Bowl instead of a quick smoothie in a glass, it gives the opportunity to sit down and actually chew on your breakfast, giving the additional element of feeling like a full meal has been consumed. To make it more interesting and to add nutritional value, I like to experiment with the different textures and toppings that I add to my smoothie bowls. Where possible, try and use frozen fruit instead of fresh. It is cheaper, lasts longer and creates a thicker texture. To thicken your smoothie bowl further, add in a banana or tofu. Make your smoothie bowl more protein rich by adding in protein powder. If your smoothie is a little too thick, add in a little extra liquid – natural fruit juice, coconut milk, coconut water, almond milk, cow’s milk, water. 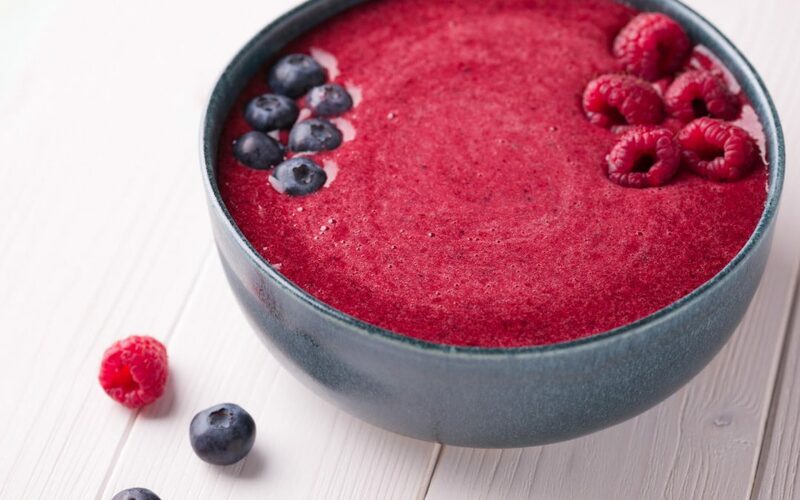 The Berry Blast Smoothie Bowl is sweet and refreshing start to the day, packed with protein and antioxidants and incredibly easy to make. To ensure the Smoothie is thick enough, make sure that you use frozen instead of fresh berries. Topping Suggestion Ideas: fresh blueberries, fresh raspberries. Add liquid (splash of juice or water) if it is too thick or add a few cubes of ice if it is too thin. Pour into a bowl or your favourite glass. Consistency not quite right? Add more liquid if your smoothie is too thick. Add a few cubes of ice if it is too thin.